Blackinton B553 Shield Badge - B553 - 2 5/16" x 2 1/2"
Home > Blackinton > Police Badges > Badges without Eagles > B553 Shield Badge - B553 - 2 5/16" x 2 1/2"
B553 Shield Badge - B553 - 2 5/16" x 2 1/2"
The Blackinton style B553 is a wide shield measuring 2 5/16" by 2 1/2". Offering two panels, this Blackinton shield badge allows customization with your department, name or other identifiers. This classic shape contains enough space in the center for your seal. 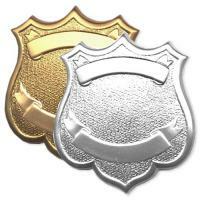 This badge features polished thick rims and are available in multiple finishes including gold and silver. This product is USA made. Please allow 4-6 weeks for delivery. Dimensions: 2 5/16" x 2 1/2"
©2002-2019 CopsPlus.com: Blackinton B553 Shield Badge - B553 - 2 5/16" x 2 1/2"